This past saturday while at school, one of my learning leaders and the "Be Nice or Else" team was helping to make a video on "IT Gets Better" project. For those of you who do not know what this project is, this project is like a support group that is bringing awareness to the bullying to people, more specifically lesbians and gay teenagers and the result of this bullying would lead to many suicide deaths. "Growing up isn't easy. Many young people face daily tormenting and bullying, leading them to feel like they have nowhere to turn. This is especially true for LGBT kids and teens, who often hide their sexuality for fear of bullying. Without other openly gay adults and mentors in their lives, they can't imagine what their future may hold. In many instances, gay and lesbian adolescents are taunted — even tortured — simply for being themselves." Here is the link to the youtube page for The It Gets Better Project: for more information! I chose to write about this not only because I helped filmed a part of a video for this project, this is something I feel very strongly about. My heart hurts deeply when anyone is being bullied because he or she is different, or strange or weird, or gay. When people are hateful because of sexual orientation, it gets me so angry. Why all this hatred? It is so ignorant! I know so many gay men and women, and all of them, each of them is so beautiful and has such an amazing heart and soul, I dont understand how people can be so judging! I love that Lady Gaga also talks about this and she is a good example of someone who stands up for the gay community. 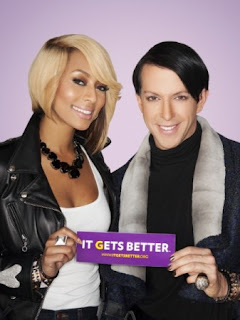 Check out a video I found that addresses "It Gets Better"
It shouldnt matter of who loves whom, gay or straight, black or white, or whatever, we are all people and unique in our own ways. I am getting off subject, but I just wanted to blog about this and I plan on making a video for the project as well and posting when I can. 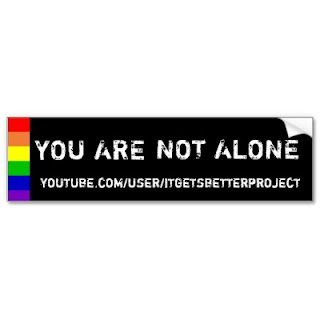 I hope you take the time to check their youtube page out and be more aware of the bullying of gay and lesbian teens and adults. Thanks for stopping by my sweets. Have a great night!